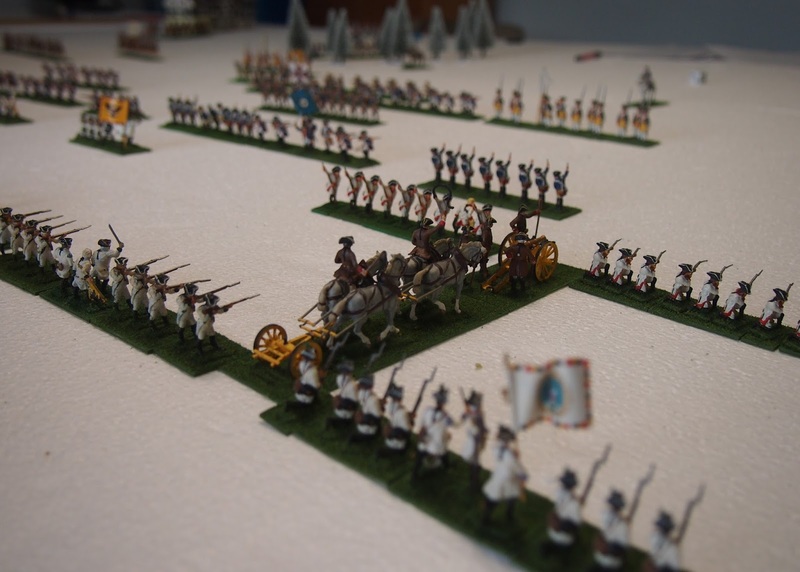 Historically, Mollwitz was the first victory for the recently crowned Frederick II of Prussia. 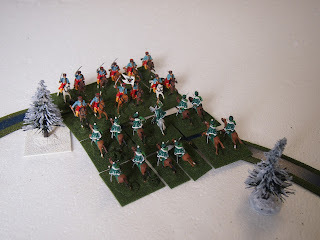 This was another chance to use our snow terrain (yippee!) 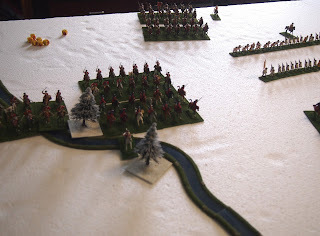 as, despite the date (10th April), a snow storm in the days prior to the battle had left the field covered in heavy snow. The armies advance towards one another. ... and were victorious, capturing the enemy's flag and causing some of the Austrian heavies to be carried away with their retreat. An early Prussian victory! 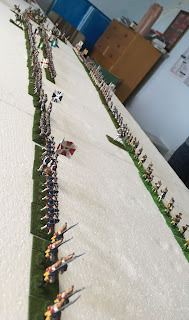 On came the infantry attack. 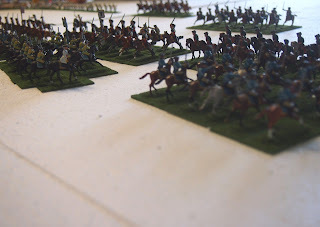 ... and were particularly accurate. This affront seemed to be a signal to the Austrians who unleashed their ace: their superior numbers of cavalry. 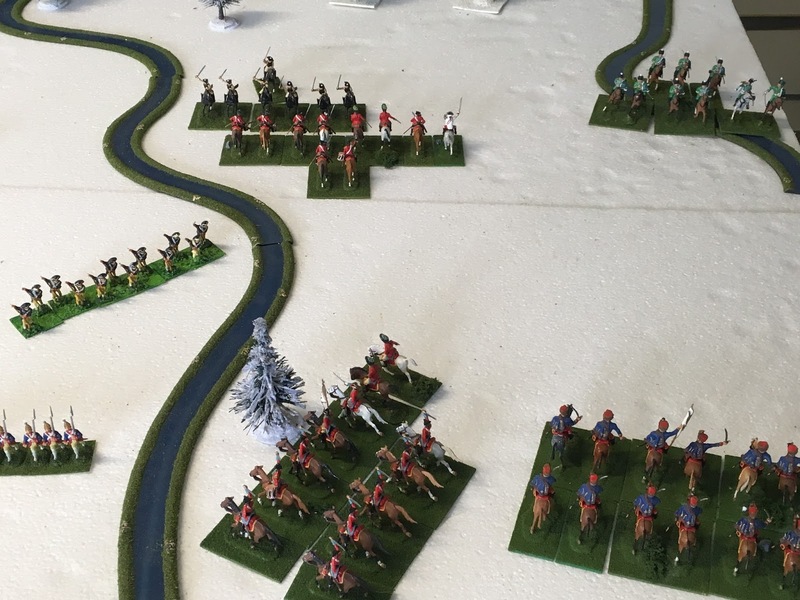 The cavalry mêlées went the way of the Hapsburgs, but they were not as victorious as they would have liked (and needed to be). 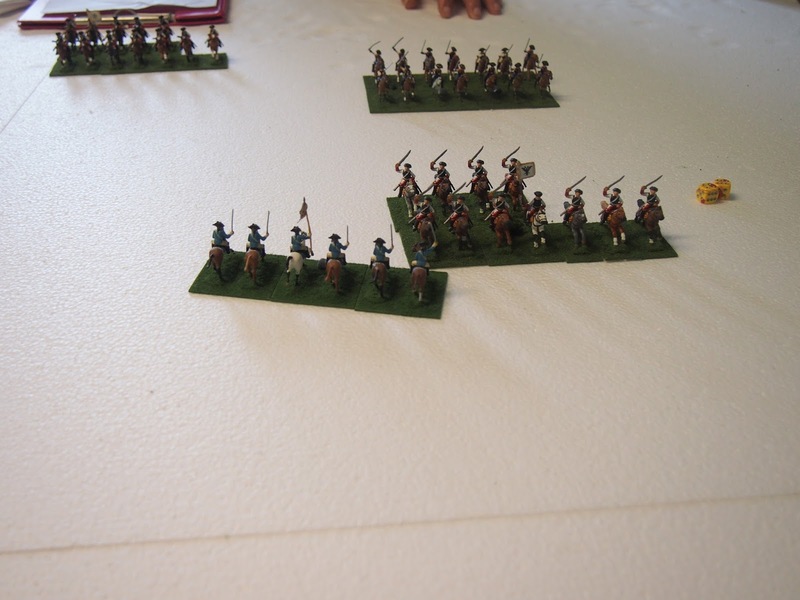 As in the real thing, and in a pure piece of wargaming serendipity, the Austrian cavalry general Römer was killed in these combats! 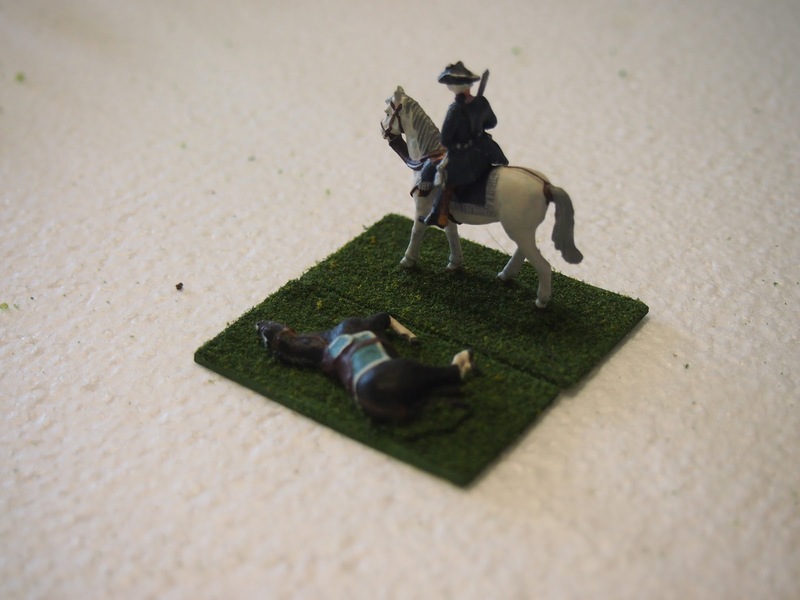 The limited Austrian artillery had not caused the advancing Prussians too many casualties, but a chance, bounce-through hit General Prinz Leopold, causing him to need a fresh horse. 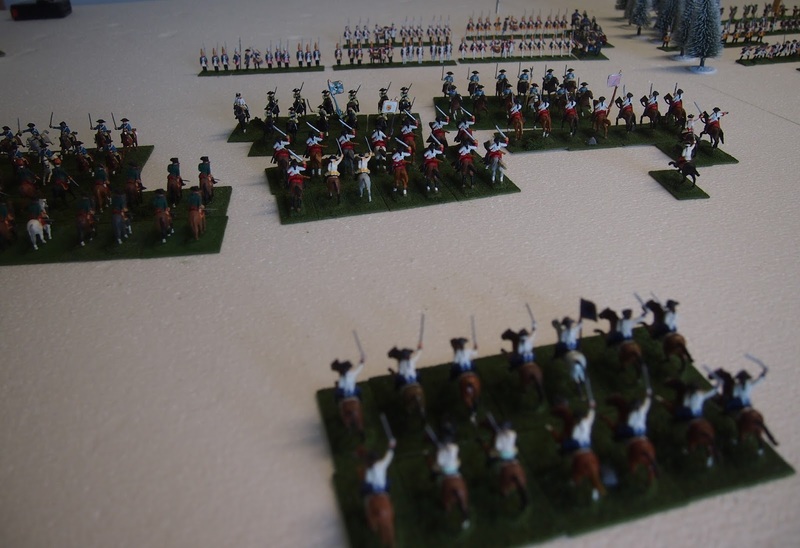 The Austrian cavalry had control of the Prussian left flank, but the opposing grenadiers would not be easy to deal with. 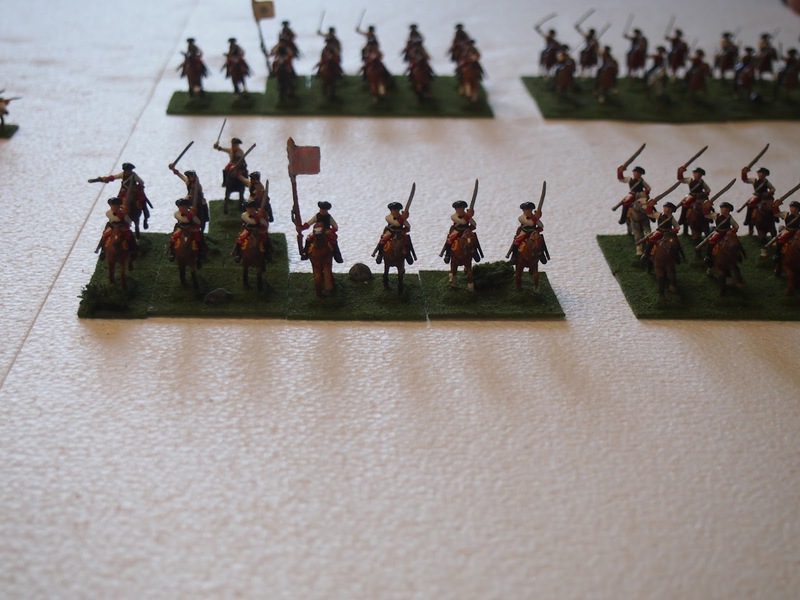 The opposing lines came within musketry range and the volleys began. Austrian cavalry on the Prussian left sought to complete their ascendency. 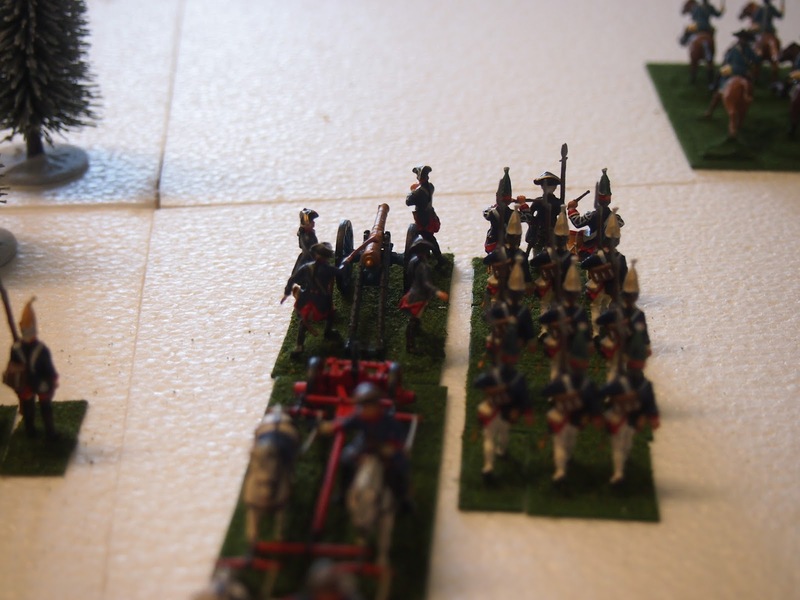 Back on the Prussian right, the grenadiers were keeping the enemy cavalry at bay. 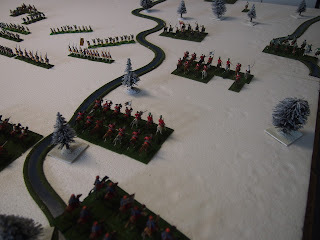 Early Austrian advantage in the firefight lead Frederick to be convinced by General Schwerin to convince his monarch to retire from the field (a roll of two for initiative causing this effect). The infantry closed to close range along the entire line. 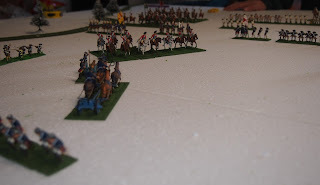 ...The Austrian cavalry on the Prussian left had found a flank. Too little, too late? 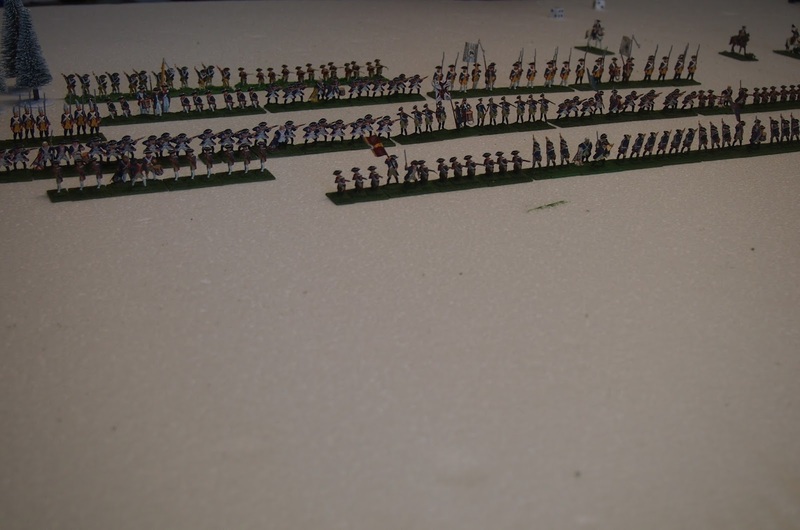 Close range musketry resulted in the lines of both armies being greatly reduced. 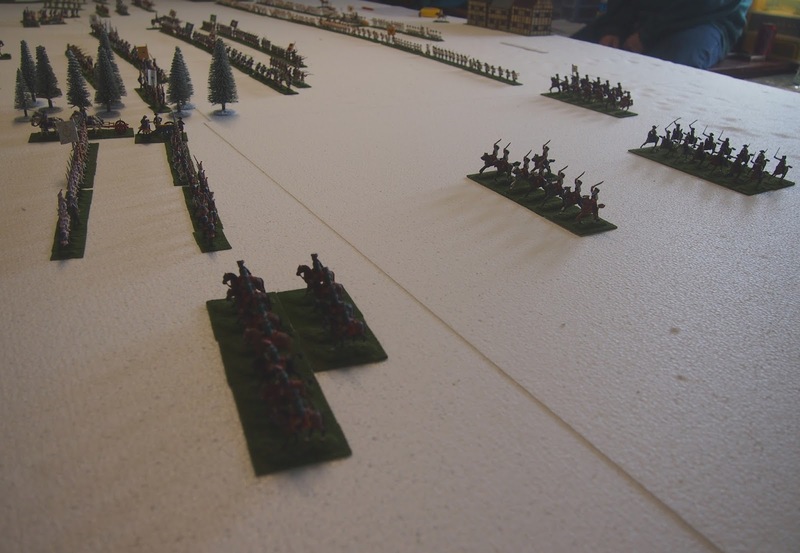 Casualties had mounted up so that both the Austrians, with 1/3 losses, and the Prussians, with 1/4 losses—just under 1/3) had to take an army withdrawal test. The Austrians failed their test and withdrew. Shattered by their exertions, the Prussians moved to the shelter of Mollwitz and surrounding villages to rest and recuperate. 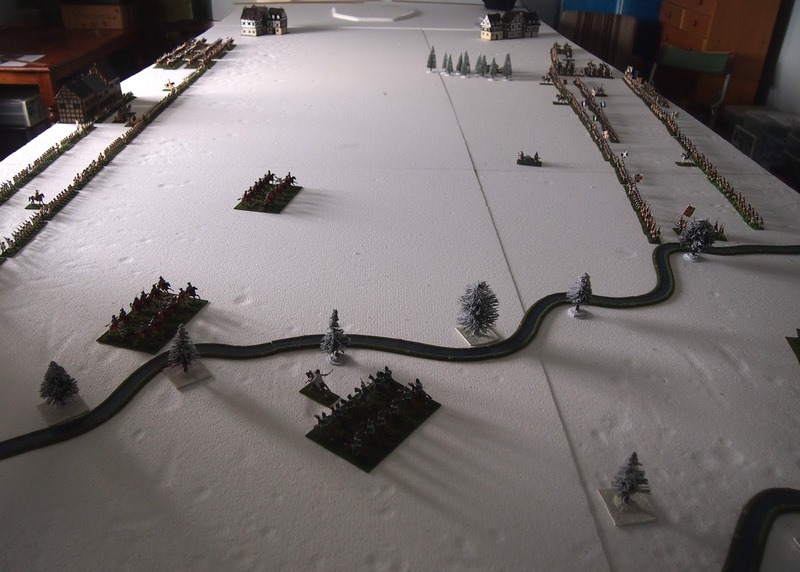 "Mollwitz was a long, tedious, and bloody battle (lasting over seven hours, interminable by 18th century standards). Each side lost approximately 4,000 casualties (KWC), the Prussians actually a little more. 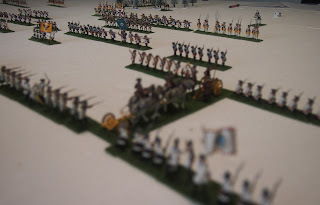 But the Prussians kept the field, and so, under the stilted conventions of Enlightenment warfare, won the day and the political point, saving Silesia for Prussia. 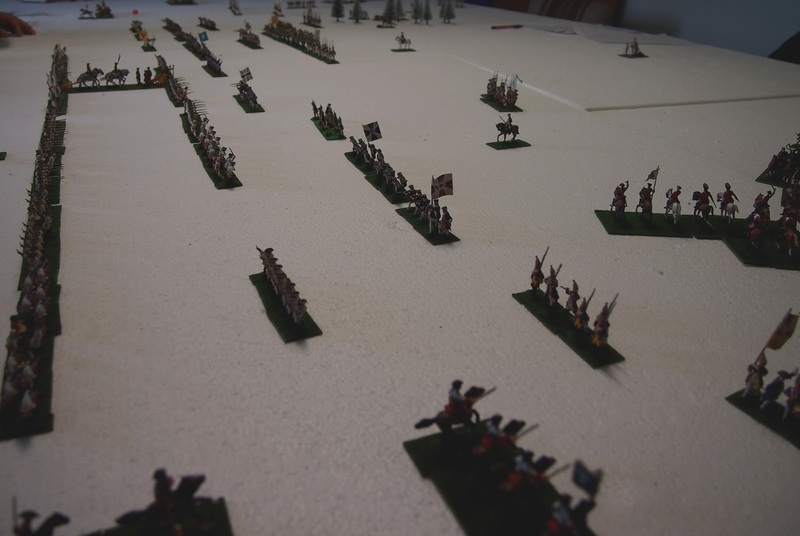 Frederick had won his first battle." So it was with our version too. 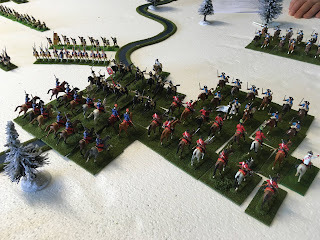 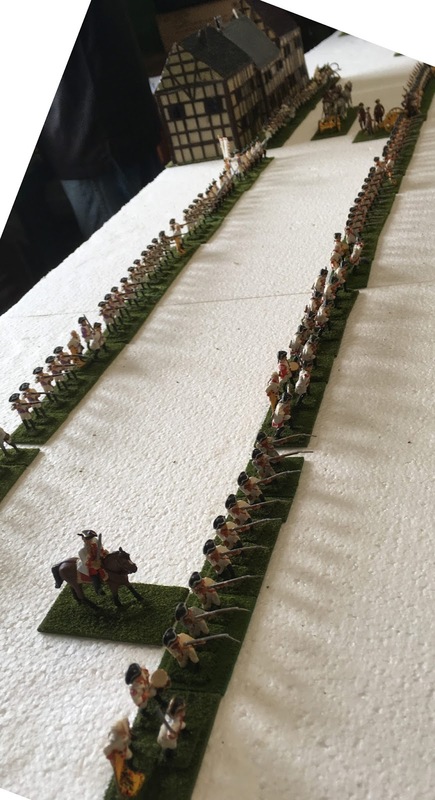 Our game was a little quicker than the real thing, having run for six turns (hours), but the casualties on both sides were large, noticeable to the players and clearly evident in the photos in this post. Mark for designing the game and supplying majority of the figures. 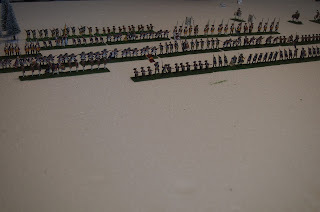 Julian for supplying remaining figures, venue and hospitality. David and me as the winning Prussians for ensuring that Frederick's history remains intact! 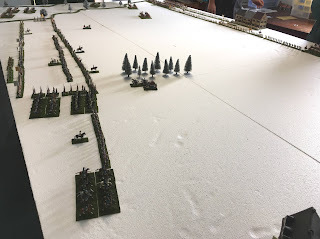 After our four-session (month) epic of Friedland earlier this year (see post at link if you missed it), we are having one of our sojourns from Napoleonics. This allows each of us to stage a game (or more) from among the 'periods other than Napoleonics' that we also indulge in—while we build up for something big in the greatest wargaming period (IMHO). 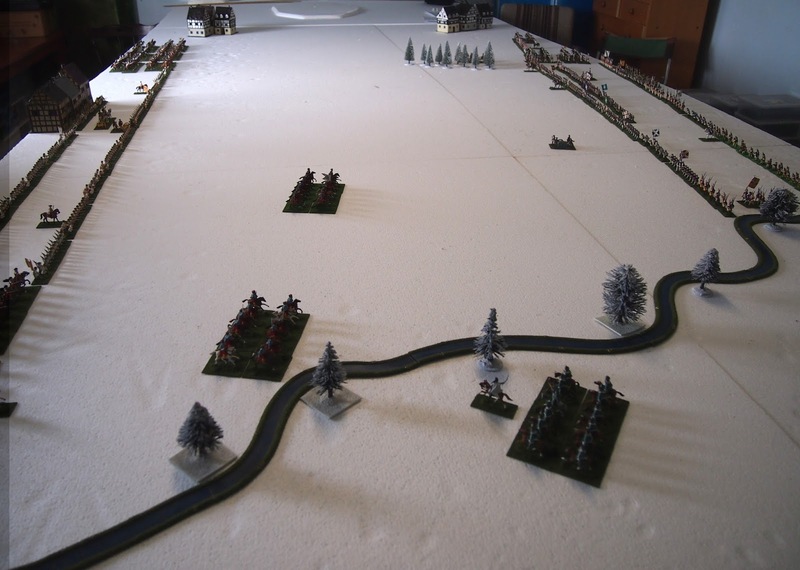 For our next scheduled session on 22nd October, Mark is planning a game from the Mercenary War (240 BC – 238 BC), perhaps based on Bagradas River? Snow games, snow games, I love snow games...and this one is beautiful! I only hope that the captured flag is not lost, buried in snow! Bagradas is a nice one! 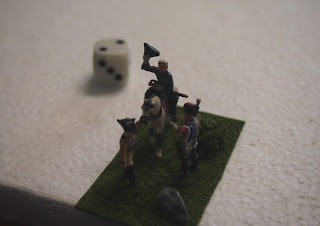 Thanks Phil. 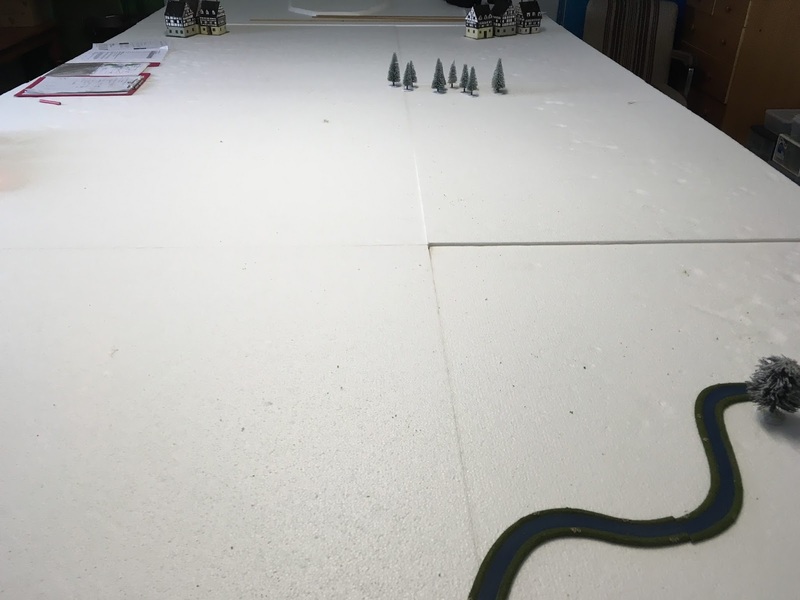 The foam sheets make snow games really easy too. 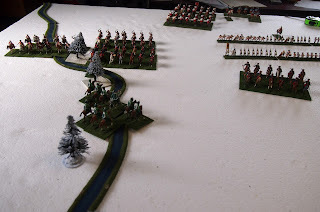 Mark's painted trees look a treat. 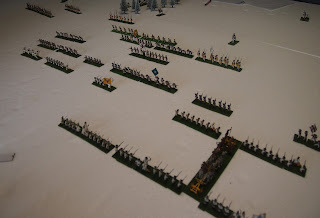 Certainly looks good and I'm sure was not an interminable game. The usual Mark; plenty of fun, plenty of laughs! These 'Age of Reason' games are enjoyable and look fine with all those lines. 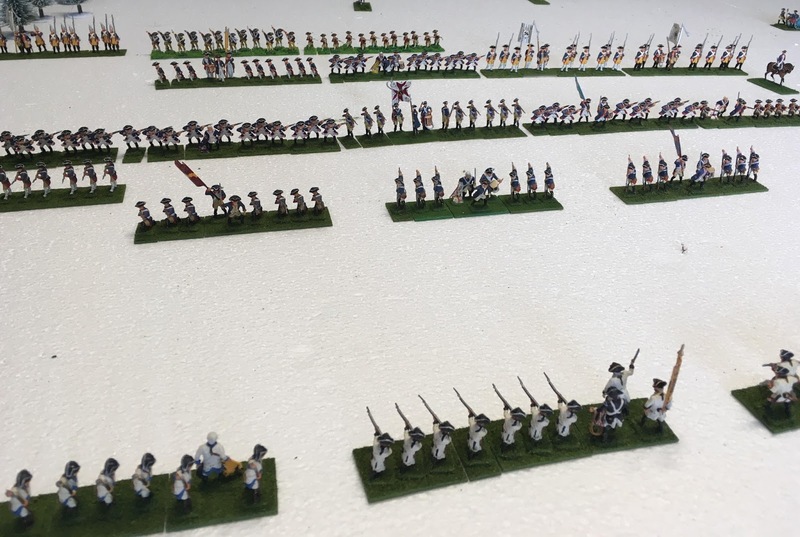 In comparison to Napoleonics I consider them a bit like a game of soccer when compared with a free-flowing, action-packed game of Aussie rules! 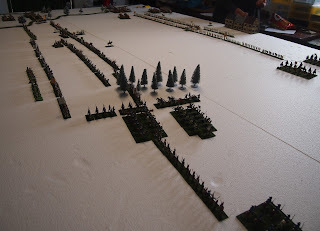 Great Battle Report as per usual James. I love snow terrain as well and am looking forward to the day when I make up a 12 x 6 of it for Eylau etc. 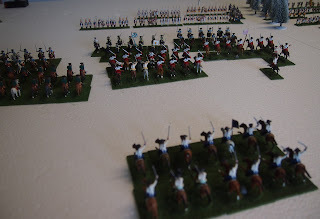 Eylau is still one of my favourites from amongst the bicentennial games that we did. 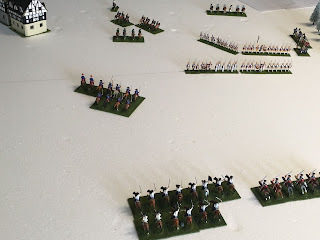 It's high up on the list of those that I'd love to do again, despite the wide flank manoeuvre with the French cavalry being such an unmitigated disaster!! 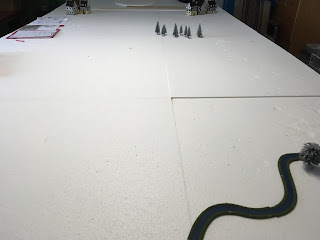 The photos really did the table and snow terrain justice! 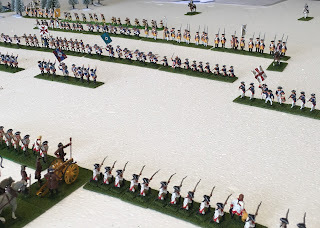 Great game with lots of laughs. Thanks for the invite. 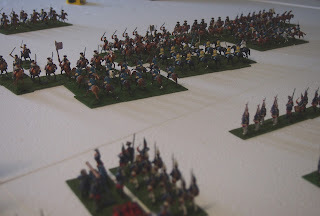 We always enjoy having you join us David; on the 22nd perhaps?